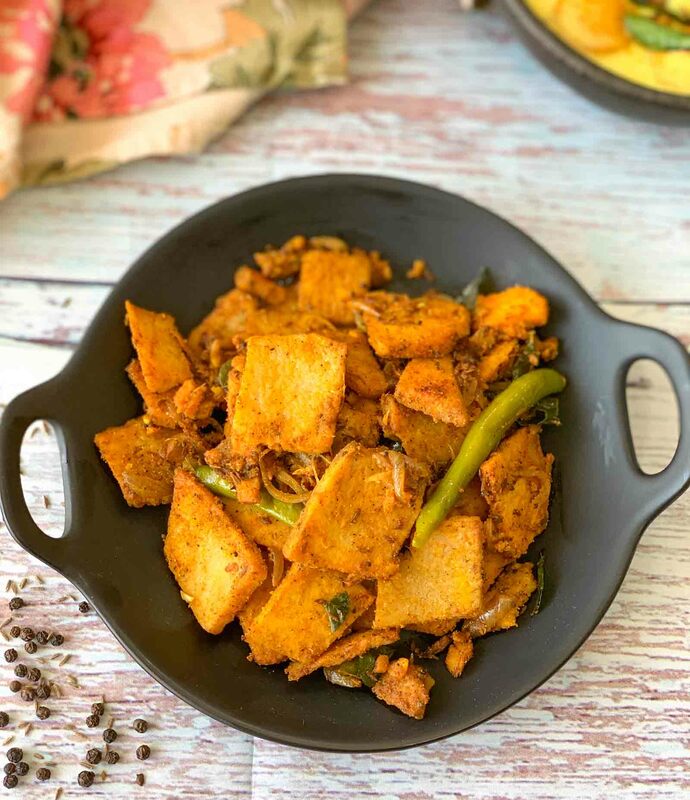 Sukhi Suran Masala Sabzi Recipe is a spicy dry sabzi recipe where sliced yam is stir fried with aromatic spices and masalas to make a flavourful spicy side dish recipe. 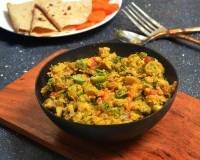 Serve Sukhi Suran Masala Sabzi along with a nice meal on a weekday. 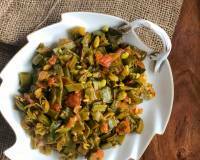 Sukhi Suran Masala Sabzi Recipe is a delicious flavourful recipe made with suran/yam stir fried along with onions and spices. 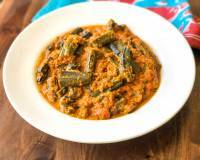 This simple to make recipe is a good way to include yam in your diet. 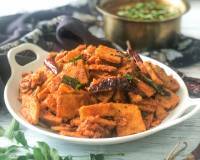 Yam is known as ‘Suran‘ or ‘Jimikand‘ in Hindi, ‘Kandagadda‘ in Telugu, ‘Senai Kizhangu‘ in Tamil, ‘Chena‘ in Malayalam and ‘Surangadde‘ in Kannada. It comes in various shapes and sizes and it is a tuber. 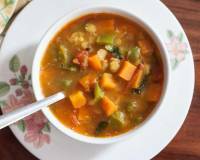 Yam has good complex carbohydrates and soluble fiber and is a good source of Vitamin B complex. Serve Sukhi Suran Masala Sabzi with Dal Palak, Steamed Rice and Curd for a healthy weeknight dinner or even pack into your lunchbox. 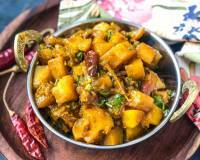 To begin making Sukhi Suran Masala Sabzi Recipe first prepare the yam, remove the hard outer skin and then slice yam/ suran into one inch square pieces. Soak the sliced yam pieces in water and keep aside. Next heat oil in a non stick wok/Kadai or a deep pan and add curry leaves and cumin seeds, saute for a minute. Add the sliced onions, ginger and garlic and saute till the onions are translucent and softened. Now add the drained suran and saute for a minute. Sprinkle some water, salt to taste and cover the pan and cook the suran and onion masala on low heat for ten minutes. 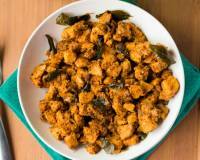 Once the suran is cooked then add all the dry spices like red chilli powder, coriander powder, jeera powder, black pepper powder, garam masala and stir the masalas in the suran. Stir fry for 3 to 4 more minutes until the masala gets well coated to form a delicious tasting Sukhi Suran Masala Sabzi. Check the taste and adjust the salt and spices accordingly. 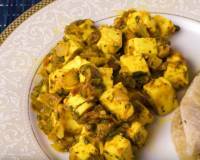 Once done, turn off the heat and the Sukhi Suran Masala Sabzi to a serving bowl and serve hot. Serve Sukhi Suran Masala Sabzi with Dal Palak, Steamed Rice and Curd for a healthy weeknight dinner.